Finally, the time has come to pull the covers off the shiny new look Shutterly Fabulous. It’s been a ton of work but we really think it’s been worth it and more importantly you do too! When Mark and I started the company over 10 years ago, we wanted to create a company with outstanding service, a great quality product that offered real value for money. “Stick to those core values and we’ll be OK!”A lot has changed in those 10 years and we’re a different company than when we started Shutterly Fabulous in a spare room in our house. We’re one the UK’s largest shutter companies, with a unique product that ensures we stand out from the crowd, for all the right reasons. Twelve months ago, we took a step back from the day to day operation and as a result gained a clearer perspective. As such, we felt the message of Shutterly has become a little confused, a little diluted and well, we just weren’t conveying our fabulousness as effectively as we used to! So, we stripped things back, spoke to lots of different experts and found a partner to help us, who was exactly on our wavelength. We’ve not found our groove again with a look and tone of voice that’s very Shutterly Fabulous. Step inside, poke around and look under the bonnet of our slick new site. Book an appointment just for an excuse to see our lovely new Mini’s and vans. 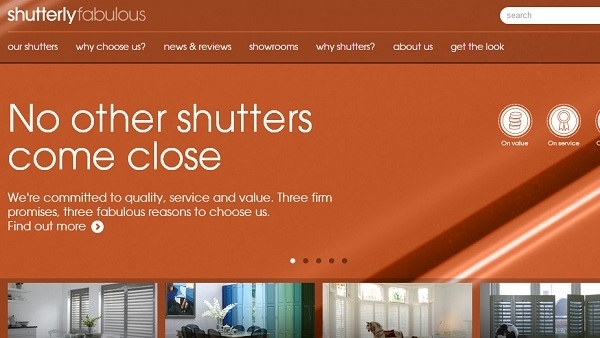 You won’t miss them coming down your road – that’s for sure!We truly do believe that ‘No Other Shutters Come Close’.